Students who are English Language Learners (ELLs) need guidance in developing both academic and interpersonal communication skills. Teachers of ELLs are charged with the task of developing English language proficiency and teaching grade level content. According to English proficiency expert Jim Cummins, teachers of ELLs must understand the difference between social language (Basic Interpersonal Communication Skills) and academic language acquisition (Cognitive Academic Language Proficiency). Read More about Basic Interpersonal Communication Skills (BICS) and Cognitive Academic Language Proficiency (CALP).Read More about Basic Interpersonal Communication Skills (BICS) and Cognitive Academic Language Proficiency (CALP). Basic Interpersonal Communication Skills (BICS) are language skills needed to interact socially with other people. ELLs employ BIC skills when they are on the playground, in the lunchroom, on the school bus, at parties, playing sports and talking on the phone. Social interactions are usually context-embedded, and typically develop within six months to two years after arrival in the U.S. Problems arise when teachers and administrators believe that a child who demonstrates good social English skills is proficient in the language. Cognitive Academic Language Proficiency (CALP) refers to formal academic learning. This includes listening, speaking, reading, and writing about subject-area content. This level of language learning is essential for students to succeed in school. Students need time and support to become proficient in academic areas. This usually takes from five to seven years. Academic language acquisition isn’t just the understanding of content area vocabulary. It includes skills such as comparing, classifying, synthesizing, evaluating, and inferring. As a student gets older, the context clues provided in understanding academic language are progressively reduced. How Can VocabularySpellingCity Help Develop CALP? Our interactive games provide the essential instructional factors for building academic vocabulary and fluency, including pictures, repetition, oral language, phonemic awareness and phonics. Students also get immediate feedback that helps them monitor their learning, and with Premium Membership, teachers receive progress reports that help them make instructional decisions and differentiate instruction based on individual student data. Click 'Continue' to play with this list or enter your own. Please enter four valid words to play. Or click "Continue" to use our list. 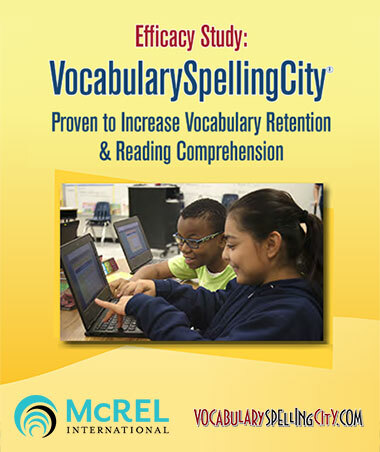 ELL teachers can use VocabularySpellingCity to develop their students’ CALP, as the program’s activities are aligned to the three essential components of reading instruction. Phonics instruction stresses learning how letters correspond to sounds, and how to use this knowledge in reading and writing. The goal is to help children understand that there is a systematic and predictable relationship between written letters and spoken sounds. Facilitates phonics instruction through interactive games that help ELLs learn the English language in a fun, non-threatening way. These activities include vocabulary, spelling and writing exercises, and open up a world of games, activities, and assessments that will promote learning. Try our phonics game Initial Sound Speller with a first grade word list. Vocabulary development is one of the greatest challenges to reading instruction for ELLs. As we know, limited vocabulary impedes comprehension. So vocabulary needs to be taught explicitly, and students need multiple exposures – educational researchers recommend 12-14 – and interactions with new words. Offers a variety of ready-made word lists that teachers can use to support and/or individualize vocabulary instruction. Prepared lists include vocabulary from Tier 1, Tier 2, and Tier 3 words; informational and literary texts; and words from content area such as math, science, and social studies. Teachers can also customize word lists to meet the individual needs of ELLs in the classroom. Try Word-O-Rama with fourth grade informational text vocabulary words. Reading fluency, including oral reading skills, is the ability to read words accurately and quickly, and a critical factor in reading comprehension. According to the Center for the Improvement of Early Reading Achievement (CIERA), ELLs need to see and hear hundreds of words over a school year to become fluent. 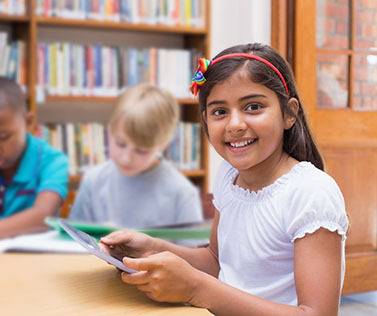 Offers ELLs the opportunity to repeatedly listen to high frequency words, including sight words, vocabulary, and developmental spelling words, to gain English fluency. Pairing these word lists with engaging, interactive games supports automaticity and word recognition. Try SpeedySpeller with a second grade Dolch word list. VocabularySpellingCity Premium Membership allows teachers to differentiate instruction, assigning specific lists and activities to individual students, groups of students, or the entire class. Teachers can track progress, and even have the option of creating Review Lists for each ELL student based on results from previous assessments. Students can electronically submit assignments. Under the Every Student Succeeds Act (ESSA) signed into law in December 2015, English Language Learners’ accountability will be included under Title I instead of Title III, thus identifying ELLs as a priority. Learn more about how VocabularySpellingCity meets the requirement to supplement the core literacy curriculum at Title I schools.